Last weekend Chris and I spent some time in Sonoma with some coworkers and friends Denis (from Canada) and Richard (a Brit from where else!). The guys decided to drive up to Napa as Chris and I had plans to stay in Sonoma for a short weekend while I was in California for some training at our employer the following week. On the drive from the air port to Sonoma, we made a couple of stops that we call “drive by’s”. (this means we didn’t have a tasting scheduled, rather stopped for a quick tasting.) One of the stops was at Beringer Winery where Chris and I have been members for years. I foresee that we will remain members for years. We enjoy Carlos and Eddie who are great guys in hospitality. The Reserve tastings at the house are pretty cool too! I would like to meet Laurie Cook (The wine maker) sometime. While we were there, we tasted some pretty delicious wines including the latest release of the 2007 Beringer Private Reserve. Tasting the Private Reserve brought me back to a few weeks ago when Chris and I had a bottle of 1998 for dinner with a great steak! Do you every have one of those flash backs? I know I do frequently. 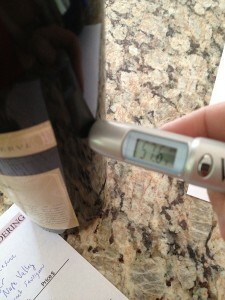 Before Chris and I enjoyed this wine, I wanted to make sure the temperature was right. It was a bit warm so it went from my cellar into my refrigerator. It is best served close to 60°. I especially make sure the cherished old wines are served at the proper temperature. In the image you see a bottle thermostat. I highly recommend you invest in one as they work great to ensure that your wine is close to the right temperature. I know Claude says a corks tells no story, but I tend to disagree! 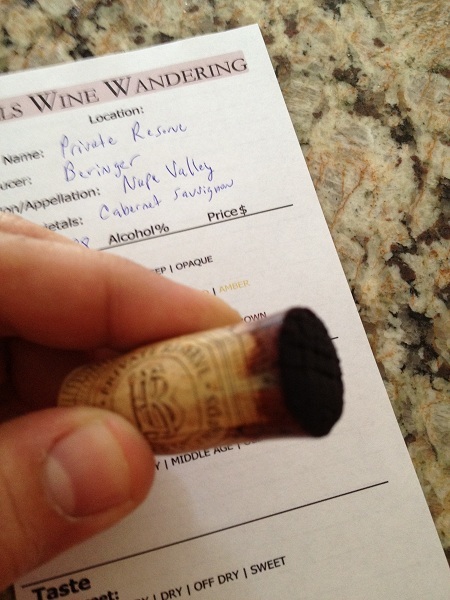 I believe that a cork tells you a lot about the history of a bottle of wine. As I looked at the one pulled from the 1998 Beringer Private Reserve, I can see it is middle aged. The cork itself is holding up pretty good and you can see the Cabernet Sauvignon soaked into the cork appears very dark in color. I am anticipating the wine will too look old, but still ready to live another day. 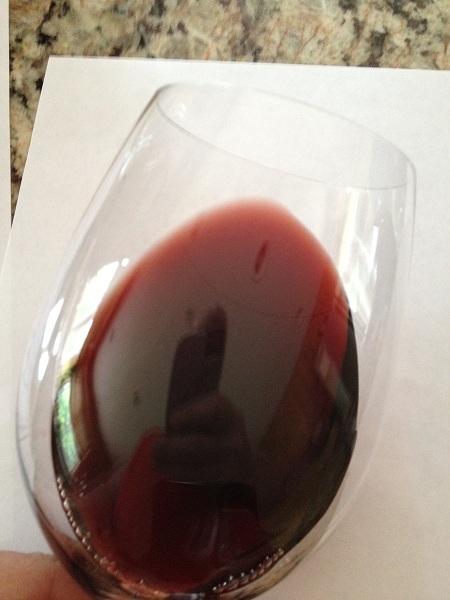 It was time to pour the Private Reserve into my glass… As I let it settle, I noticed that it was looking pale. I believe that this wine is past the top of the bell curve if you know what I am saying. The color of the Private Reserve was a purple to brick color. Pretty good for a 23 year old bottle of wine. I also have to say I saw no sediment and was it was very clear. It was time to sniff this old friend. I was anticipating some floral notes. The aroma was not intense, which I prefer. Strong wines generally smell like alcohol to me. You could see the Private Reserve was showing old age. I could smell dark ripe fruit and it had an earthy nose (I love this!). It was time to taste it! As we tried it, we noticed that it was a little dry. It was still medium bodied and very impressive. The tannins were medium with a medium finish. The soft tannins attacked the front of my tongue and finished in the middle of my palate. The flavor was Dark Cherry. I find that it is sometimes hard to describe an older wine. All I have to say is “try it”. If you have one of those O.M.G (Oh My God!) moments you will be right there with me! 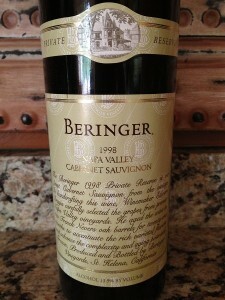 Both Chris and I rated the 1998 Beringer Private Reserve four glasses. And on a fun note, this wine is the same age as our oldest son Nick who is doing great!